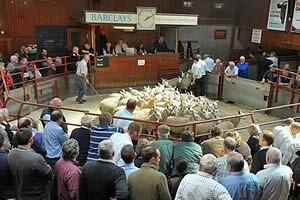 The Cumberland & Dumfriesshire Farmers Mart had forward only 405 store lambs at their sale at Longtown on Tuesday 30th November, 2010, due to the wintry weather. Trade was on par with recent high rates, numbers short of requirements. Top price of £73 for Texels from Old Hall, others £68 Low Longthwaite, £67 Bloch; Beltex £72 Low Longthwaite; Leicester £66 Old Hall; Cheviot Mule £66 Dinley; Suffolk £66 Bloch, £65.50 Dinley; Greyface £59 Milescott, £58 Bloch, £57.50 Leahaugh, £56 Coatlith Hill; Cheviot £56, £55 Dinley; Blackface £44.50 Leahaugh. Cast ewes to £58 Dinley.